Nenuvariel is a willow woman or dryad. The dryads were called into being by Aslan. Nenuvariel, like many willows, is quite tall and has long, blond hair. She prefers cool lands and moist soils. She especially likes the rich brown loam that looks so like chocolate that King Edmund had to try some. She also likes a pinkish earth that is "lighter and sweeter" and "delicate confections of the finest gravels" (from Prince Caspian). Nenuvariel is a quiet dryad who usually stays in the company of other dryads, although she has been known to dance with a faun or two. But one day some centaurs befriended her and her world became a larger place. Nenuvariel of the Elves went by many names. Later Elves would say that Nenuvariel was her father-name. It meant the Maiden of the Pool of Lilies. They would say that her mother-name, the name of insight, was Nieninqe or Nieninquiel, White Tear Maiden. She was also called Nienquilote, Whte Tear Flower Maiden. In later years she was called Lindomiel, Daughter of the Song of Twilight, or Linarbeleth, the Song of the Waning Sun, or Lasselantial, Daughter of the Falling Leaves. But in fact, these were all names that were given to her over time. When one lives for thousands of years, new names are taken to express how the world around you has changed. She was born at Cuivienen when only the stars shone in the sky. Of that time, she talked little. It was a time when shadows haunted the mountains and floated across the sky - blocking the light of the stars themselves. Orome of the Valar had finally come to bring the Eldar, the Elves, to Aman. The journey had been long. The Vanyar and the Noldor faithfully headed to Aman but others were frightened by the towering mountains of mist, which were taller in those days, and the smoke that still rose in the north from the fighting. Nenuvariel and some of the Teleri (Elwe's kin) paused along the beautiful River Anduin. There under Lenwe's leadership they stayed for some time and were called the Nandor, "those who turn back". Some of the Nandor stayed along the Great River. Some headed to sea, and some crossed into Eriador. Finally, Nenuvariel and others followed Denethor, son of Lenwe, from Eriador into Ossiriand in Beleriand. There they became the Laiquendi or Green Elves. They found that most of the Teleri had moved ahead of them into Beleriand around the River Gelion, just to the west of where the Laiquendi settled. The Vanyar and Noldor were further west in Beleriand. The Vanyar and the Noldor were the first to board the island ferry and travel to Aman. The Teleri, left behind again, gathered at the Mouths of the Sirion. Some left when Ulmo returned for them. But Nenuvariel had grown to love Middle Earth and she tarried amongst the Elves and Edain of the First Age. At the end of the First Age, she and others of the Teleri finally made their way to Aman. Although Tirion was closed to them the way to Tol Eressea, the Lonely Isle, was still open. So they settled in Avallone, the harbor on the southern shore, and Alalminore, 'the land of Elms', and Kortirion, built in memory of lost Tirion. Now it was the Second Age. The Dunedain, the descendants of Elros, brother of Elrond, had settled in Numenor. The Dunedain were willing to risk their short lives to explore the unknown. Could Nenuvariel of the Elves do any less? Now Nenuvariel was on the Dawn Walker, or in Quenya, Amaurea Vanta. It was a fine, ocean-going N�men�rean ship with two masts and four sails. They were bound for the Walls of the Sun. Nenuvariel is born in Cuivi�nen in the Ages of Starlight. Her name means "Maiden of the Pool of Lilies". Some call her Nieninqe or Nieninquiel, "White Tear Maiden". She follows the third host, Elw�/Thingol and the Teleri, on the Great Journey. Elmo, the younger brother of Elw�, is in love with Nenuvariel's sister, Meldiriel ("Friend"). Nenuvariel's brother is Idhrenion (pronounced Eeth-rehn-ee-on), which means "Wise". 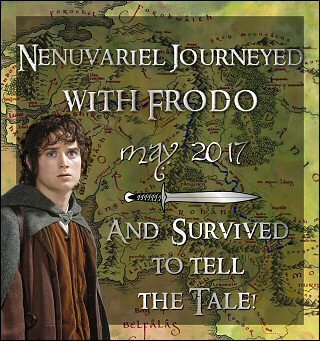 Nenuvariel stays with Lenw� and others who turn aside from the Great Journey at the Misty Mountains. The other Elves call them the Nandor (in Quenya). The Nandor call themselves the Lindi and the Danas (Sindarin Danath). Elmo follows his brother, Elw�, but Nenuvariel's sister follows the Nandor. Nenuvariel, her sister, Meldiriel, and brother, Idhrenion, wander around the Anduin with the Nandor. Denethor, son of Lenw�, hears of the strength and peace of Doriath/Menegroth, which is under the leadership of Thingol and Melian the Maia. Nenuvariel and her family follow Denethor and his people to Beleriand. Thingol and Melian welcome them as kin. They are invited to settle in Ossiriand, which they do. They become the Laiquendi of Ossiriand and live south of the Rathl�riel or River Ascar. The Dwarvish city of Nogrod (Tumunzahar) is east of the Rathl�riel in the Blue Mountains. Nenuvariel's sister rejoins her husband, Elmo, in Doriath. Nenuvariel also visits Doriath and her sister's family. Nenuvariel is in Ossiriand when the Moon and then the Sun first rises. In the first years of the First Age, she explores her world. She often visits her sister in Doriath. She is at Eithel Ivrin for the Feast of Reuniting, hosted by Fingolfin for the Noldor and the Sindar in FA 21. Eithel Ivrin was a spring and cataract in the southern part of the Ered Wethrin or Shadowy Mountains. It was the source of the river Narog. Eithel Ivrin was also called the Falls or Pools of Ivrin. The eastern part of the Shadowy Mountains was the source of the river Sirion. At the Feast of Reuniting Nenuvariel meets an Elf of Brithombar, Eruheru Taurvantian, and her brother, Idhrenion, meets Lalwend�, the sister of Fingolfin. After the (successful) Glorious Battle of First Age 56, Nenuvariel leaves Doriath and heads west to the sea. Her brother, Idhrenion, goes with her. They end up in Vinyamar. Turgon is away, building Gondolin. But Lalwend� ("Laughing Maiden", her mother-name) or �rien (her father-name) is there. Lalwend� is a sister of Fingolfin and is Turgon's aunt. Lalwend� followed Fingolfin into Middle Earth. Lalwend�'s other sister, Findis, stayed with their mother, Indis, in Aman after Finw� was killed. Lalwend� was living in Hithlum in the north with her brother, Fingolfin, but she came down to Nevrast to help her nephew, Turgon, while Turgon is away building Gondolin. Lalwend� falls in love with Nenuvariel's brother and he stays with Lalwend� in Nevrast. When Turgon moves to Gondolin in FA 104 or 110, Lalwend� or Lalwen returns to Hithlum with her husband. Lalwen and Nenuvariel's brother mostly stay in Hithlum although they also spend some time in Dor-l�min, which is the realm of Fingolfin's eldest son, Fingon. Dor-l�min is south of Hithlum and northeast of Nevrast/Vinyamar. During the First Age, Nenuvariel continues to visit her sister, Meldiriel, in Doriath, her brother, Idhrenion, in Hithlum. She also visits Nargothrond. Nargothrond was founded by Finrod, the eldest son of Finarfrin, in FA 50. Finarfin married E�rwen of Alqualond�. She is the daughter of Olw� and niece of Elw� and mother of Finrod. So the Teleri/Sindarin are welcome there. Nenuvariel marries Eruheru Taurvantian of Brithombar in the havens of the Falathrim. Their daughter is Eruliss�. The Haladin arrive in Brethil under Lady Haleth around FA 370. Frithogar is born in the Forest of Brethil. Nenuvariel's daughter, Eruliss�, falls in love with him and they marry. Frithogar becomes known as Frithogar Erynion. Fingolfin died in FA 455 in the aftermath of the disastrous Battle of the Sudden Flame but Hithlum, his kingdom, did not fall until FA 473 after the Battle of Unnumbered Tears. Nenuvariel's brother, Idhrenion, dies in the Battle of Unnumbered Tears (Ninaeth Arnodiad) in FA 473, as does young Frithogar of the Haladin. Eruliss� stays with the Haladin. Eruheru, Nenuvariel's husband, dies defending the Falas in FA 474. Nenuvariel and the survivors flee to the Isle of Balar. Eruliss�, having lost her husband and father in a short amount of time, soon dies of grief. Nenuvariel joins her sister, Meldiriel, and Elmo in Doriath. Nargothrond falls in FA 496. Nenuvariel is at Doriath when Thingol is killed in FA 505 and when Doriath falls for the second and final time in FA 509. She flees to the Mouths of the Sirion across from the Isle of Balar. Her sister and brother-in-law perish at Doriath but their son is Galadhon and their grandson is Celeborn, the husband of Galadriel. Gondolin falls in FA 511. She finally answers the summons of the Valar around FA 601 and leaves Middle Earth at the urging of E�nw�. She settles in Tol Eress�a as the Second Age starts. Nenuvariel lives in Alalmin�r�, the "Land of Elms", in central Tol Eress�a. Second Age 2221 - Many of the royal court of N�menor stop speaking Quenya. Second Age 2526 - Tar Vanimeld� becomes the Ruling Queen of N�menor. Nenuvariel leaves Tol Eress�a and goes to N�menor, where she joins an ocean-going expedition to the east. She is eager to find news of her kin in Middle Earth. Note: Nenuvariel is thus the sister-in-law of Fingolfin's sister (through her brother) and Elmo (through her sister). Some ideas pulled from Peoples of Middle Earth. Eruheru is Elijah, Taurvantian is Forest Walker (ie Woods), Eruliss� is Hannah, and Erynion is Wood. Nenuvariel of the Elves went by many names. Nenuvariel was her father-name. It meant the Maiden of the Pool of Lilies. Her mother-name, the name of insight, was Nieninqe or Nieninquiel, White Tear Maiden. She was also called Nienquilote, Whte Tear Flower Maiden. In later years she was called Lindomiel, Daughter of the Song of Twilight, or Linarbeleth, the Song of the Waning Sun, or Lasselantial, Daughter of the Falling Leaves. She was very old. Some said she was born at Cuivienen when only the stars shone in the sky, for she talked of that time often. In truth, the tales of Cuivienen came from her mother, who first awoke there. Nenuvariel was born along the banks of the Anduin, long after the sun and moon rose in the sky and the great Elven hosts headed out to Aman. Her people were the Elves of the Forests. Under their leader, Lenwe, her people had marched with Olwe and the great Teleri host. But her people had refused to cross the Misty Mountains and had turned back from the long, uncertain road to Aman. Lenwe led them down the Anduin and so they tarried long in Middle Earth. In Quenya, they were called the Nandor, "Those who go back." Their dialect was called Nandorin, Danian, or Silvan Elvish. They did not call themselves the Nandor but the Lindi and the Danas. In Sindarin they were called the Danath. 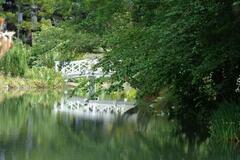 They lived in the quiet forests along the banks of the Anduin where they loved the forests and the running water. In time, some of the Nandor followed Denethor, Lenwe's son, and crossed over the Misty Mountains and into Beleriand. They settled in Ossiriand, which they renamed Lindon. The Sindar called the Elves of Ossiriand the Green Elves. But Nenuvariel continued to live along the banks of the Anduin with the rest of the Nandor. As the Ages passed, many in Middle Earth fled their homes for the upper Vales of the Anduin. They sought refuge from the horrors in the east and in the west. Nenuvariel knew of their plight for she traveled often to Beleriand the Fair to visit her kin in Lindon. In the forest of Brethil on the borders of Doriath, she became friends with the people of Haleth, who were also known as the Haladin or the Second House of the Edain. After the Nirnaeth Arnoediad and the Fall of Nargothrond in First Age 496, the Haladin were destroyed. Many of Haleth's people left the forest of Brethil that they had long defended against Morgoth and the Orcs and followed Nenuvariel back to the peaceful banks of the Anduin and the mighty forests that grew there. And on the banks of the Anduin she married Frithogar, one of the young Edain, whom she had watched grow up at Brethil. After Frithogar died, at what to Nenuvariel was only a short season later, she devoted herself to caring for his children and grandchildren. The generations passed. Throughout the Second Age, more Edain poured into the upper Vales of the Anduin. Pukel-men and Woses fled the Dunlendings. The Dunlendings fled the arrival of the Numenoreans. The Numenoreans and Edain fled the forces of Sauron and the destruction of Mordor. The Northmen of Rhovanian fled from pressure in the east. Many of the mortal Edain who grew up along the Anduin shared a distant Elvish heritage. Still Nenuvariel watched over her mortal descendants. The Elvish world was also in turmoil and the ways of the Nandor began to fade. Elves fled the destruction of Eregion and the attacks of Sauron. The Greenwood which lay to the east was growing dark and evil. The Sindarin moved into the forests of the Nandor. Before the end of the Third Age, the Sindarin tongue had replaced the language of the Nandor in Lorien and Mirkwood. By the Third Age, the mortal peoples of the upper Vales of the Anduin became a single people, although they were divided into three groups. Some loved the forests, as did the Haladin and their Elvish ancestors. These folk were closest to their distant Elvish kin. Some lived along the banks of the Anduin. They were closest to the other groups of Edain who lived to the south and east and west. Still others had the peculiar habit of burrowing into the hills. Their housing innovations spread to the other two groups. In time, they became known as the Fallohides, the Stoors, and the Harfoots. Together they were known as the Halflings or the Hobbits. In time, the Hobbits left their ancestral homes along the Anduin and made their own crossing of the Misty Mountains. They lingered in the Angle and then spread across the plains of Eriador. Nenuvariel followed them and dwelt in the forests of the Angle. When they forsook their ancient villages and settled in Bree and the Shire, she moved to a solitary home in the Old Forest, which lay between Bree and the Shire. And there she lingered, while the Third Age turned into the Fourth and last age of the Elves. The core idea for the origin of the hobbits came from Mark Berlin at Hobbits: Where did the hobbits come from?". Thank you to the contest designers!